I’ve had two backpacks this year doing trail maintenance on the Pacific Crest Trail through the Granite Chief Wilderness. Since almost all my time was up on the PCT, I don’t have anything to report about the rest of the wildneress, but since I have two more backpack trips coming up, will have a report on much if not all of the trail system. I brushed from Granite Chief trail on the north to Five Lakes Creek in the middle, and the trail is in good condition except for a short 0.1 mile part between Whiskey Creek Camp trail and Five Lakes trail that I didn’t get done, though it is not bad. I also did the Whiskey Creek Camp trail since it was getting a bit brushy. While in this area I spent some time exploring around Five Lakes Creek and Whiskey Creek, looking for the old trails that were there before the new PCT alignment was completed. In some places these old trails are easy to follow, but no always. I still think there is a trail on the south side of Five Lakes Creek to Big Spring Meadow, but so far I haven’t located it. 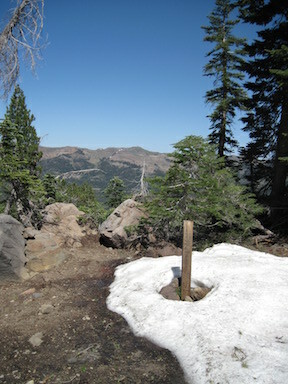 On the second trip I focused on the PCT north from the PCT/TRT trail junction near Twin Peaks. There are several sections here that are very brushy, and a few that are essentially closed in. I got all but one of these opened up again, to a point where they should be OK for about five years. But there is one very brushy section that I did not get to, and will be very bad by next year. It is about 0.2 miles. I did spot brushing on the remainder, and it is in decent shape but could use work. I think this year I accomplished what I have not in several years, keeping up with the rate of brush growth, though not gaining on it, which is why there are some badly brushed-in sections left. Next year perhaps I’ll get those last very brushy parts done, and be “caught up” at least for a couple of years. This entry was posted in Trail Conditions and tagged Pacific Crest Trail, PCT, trail maintenance on 2016-07-31 Sunday by Dan Allison. This one was primarily a trail maintenance trip for the Pacific Crest Trail (PCT) along the ridge between Five Lakes and Twin Peaks. I went in at Alpine Meadows. Waiting until the next morning I had a chance to explore around Five Lakes which I’d not done in years, and do some brushing on the switchbacks up to the crest. I planned on several days of trail work along the PCT between Five Lakes Creek and Twin Peaks, a section that doesn’t get maintained and tends to brush in. Ceanothus velutinus, commonly called tobacco brush, is the fastest growing brush, but other plants do their part. When I do brushing up on the crest I have to carry up enough water to camp with, so the trip up from the creek is heavy and slow. Unfortunately the blade on my loppers broke on the second day, and then on the third day the handle on my folding saw broke. These Fiskars tools are generally very reliable, lightweight, and easy to use, so this was unusual. But after completing only a portion of the work I’d hoped to, I just had to take off backpacking. The springs in Blackwood Creek were lower than I’ve ever seen them at this time of year. I walked out Blackwood through some aspen restorations projects that seem to be having the desired effect, and caught the bus to Tahoe City. Overnighting there, I ran into a friend Jan Ellis who I’d not seen in years. Then breakfast in Truckee and home on the train. This entry was posted in Trip Reports and tagged Five Lakes, Pacific Crest Trail, tools, trail work on 2015-03-28 Saturday by Dan Allison. I missed posting about a trip last summer, so here it is. I did not notice until I was catching up on posting photos to my Flickr site that I had an entire trip not yet labeled and uploaded. I must have been waiting until the photos were up before I wrote a post, and then forgot about both. 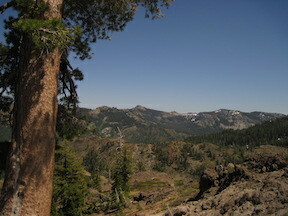 I went in at Alpine Meadows trailhead, walking up from the TART bus on the highway. There had been thunderstorms during the day, but nothing by the time I got in. There were footprints and a few people between the trailhead and Whiskey Creek Camp, but nothing and no one past there. I camped the first night at Big Meadow, always a favorite campsite. This entry was posted in Trip Reports and tagged 2014, Desolation Wilderness, Five Lakes Creek, Fontanillis Lake, Hell Hole Trail, Rubicon River on 2015-03-25 Wednesday by Dan Allison. Tahoe National Forest, USDA Forest Service, has removed almost all information about the Granite Chief Wilderness from their website. There is one paragraph on their Special Places page, and that is all. Even that paragraph is incorrect. 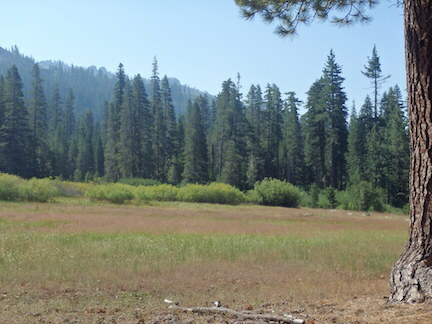 The wilderness includes the headwaters of the Middle Fork American River, not the North Fork. The map, description, and trailhead information is all gone. I suppose I should take it as a compliment that apparently they think my website is all you need to know, but still, it is a disappointment to see a public agency removing information rather than adding it. This entry was posted in background and tagged Forest Service, Tahoe National Forest on 2014-08-11 Monday by Dan Allison. 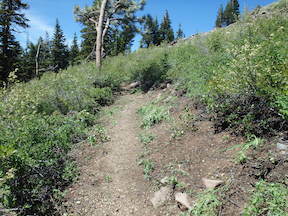 I spent two days last week brushing part of the Pacific Crest Trail that runs through Granite Chief Wilderness. This section, north of the PCT-Tahoe Rim Trail junction by Twin Peaks, is one that I started working on in 2006, when I discovered that that trail was brushed closed and people were getting lost. The part I just did was nearly but not quite brushed closed again. Brushing by myself goes very slowly, particularly when I come to an area that has a lot of small stems instead of a few big ones. I finished about 200 feet of trail. There is about a half mile of trail remaining to do. Some plants get bushy when trimmed back, others grow again in the same pattern of a few large stems that can be pretty easily cut. I realized last year that unless I spent much more of my summers brushing than I wanted, I was not going to keep up with this brushy section. Nevertheless, I like doing the work and will continue to do some every summer. This entry was posted in Trip Reports and tagged 2014, brush, fog drip, Pacific Crest Trail, trail maintenance on 2014-06-29 Sunday by Dan Allison. Last week I walked the ridges to the north and south of the Middle Fork American River. I’d looked at these ridges for years, thinking the scenery would be pretty cool, but had never gotten in a trip. I went in at the Granite Chief TH in Squaw Valley, and walked the Granite Chief Trail and Pacific Crest Trail to the saddle beside Granite Chief. I walked up over the peak and continued west, past Needle Peak, over Lyon Peak, and on out the ridge to the saddle between Talbot Creek and Soda Springs. Though the ridge is not called Foresthill Divide in this section, it is a topographic extension of that feature that separates the North Fork American River from the Middle Fork. There is a clear use trail from Granite Chief to the saddle above Needle Lake, so I assume the destination for many is the lake. 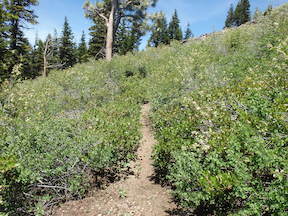 Again, there is a prominent use trail, part on old logging roads, from the Foresthill Divide saddle east on the ridge. But in between, the trail is vague, indicating that not many people walk the entire length. Though it is somewhat rough, there is nothing too challenging. I skipped going up Needle Peak due to the wind. The wind was blowing at least 30 mph the entire day, with gusts to 50 mph, and one gust that knocked me to the ground and prevented me from getting back up was at least 60 mph. The south wind, and the cold that came with it, was not in the forecast. It was an intense day, with the constant roar of wind in my ears and the need to re-balance with every step to keep from falling. And it was exhilarating! 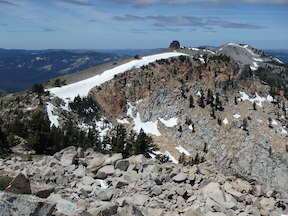 This entry was posted in Trip Reports and tagged 2014, Granite Chief, Lyon Peak, Middle Fork American River, Mildred Peak, Mildred Ridge, Needle Peak, Picayune Peak, ridge, Talbot Creek on 2014-06-22 Sunday by Dan Allison. A trip report and photos from Keith Wootton on the Greyhorse TH and trail. 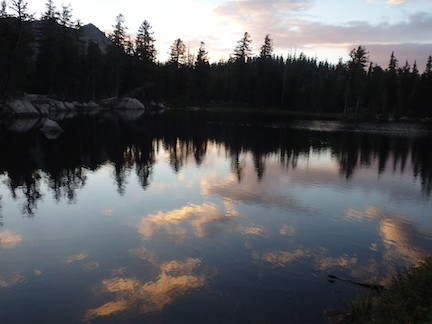 Like your website, and love granite chief wilderness. Here is the latest on Greyhorse Creek. Rode motorcycle in, 10 miles of dirt road, no road markers and it is possible to take some wrong turns. Seven miles of the road have water bars about every 100 yards, and some trees and large rocks on road. Lots of rock up to baby head size, and the water bars are high, not something to take a car on. High clearance vehicle, bike, horse, or motorcycle are good. It took me about an hour to get to the trailhead, from French Meadows, which has a Granite Chief map but no other designation. Road beyond trailhead gets worse, and steeper, and I decided I really didn’t need to go to roads-end and another trailhead, although i could have made it, just slow going. Any other method of travel would take more time than motorcycle (i rode up from Foresthill). Trail starts out faint for the first 100 yards, then runs into a sprawling mass of large uprooted trees that make the trail hard to follow, as you cross a melt water creek and push your way thru a willow thicket. Trees are recently blown over and all from the north, some have root balls 15 feet tall! I dont think there is any way a horse is going to make it thru. After that trail becomes much better as it switchbacks up between two meltwater creeks. About 2/3 way up hill, trail gets faint, then lost. Working up and to north towards bare rock outcrop with out crossing creek until you get close to rock will reward you with an easy to follow trail tread to the trail fork at the saddle. I continued north, and trail was easy to follow as it climbs, then drops down into Picayune Valley, though there were many more blown down trees. All with drying needles, and all from the north. I gave up before reaching the valley, I got a late start, travel time was more than I thought, and it took some time to find my way thru all the down trees. I did do some exploring around, and think next time I will cross the saddle at the top of Greyhorse Valley, get a better look at the Johnson monument, and continue towards Mildred Peak and lakes. This entry was posted in Trip Reports and tagged Greyhorse TH, Greyhorse Valley, Keith Wootton, Picayune Valley, Shanks Cove, trail conditions on 2014-06-14 Saturday by Dan Allison.